Sometimes training is best delivered on-site, at your own facility and with your own equipment–making for an extremely efficient and affordable way to gain professional training in whatever plastics process you need whether you need instruction for injection molding, extrusion, blow molding or thermoforming. Our custom on-site seminars are designed from the ground up for you, the processor. While there is foundational information that we highly recommend be included in every seminar, you along with our instructor, will create a course that achieves your training goals during your initial phone consultation. 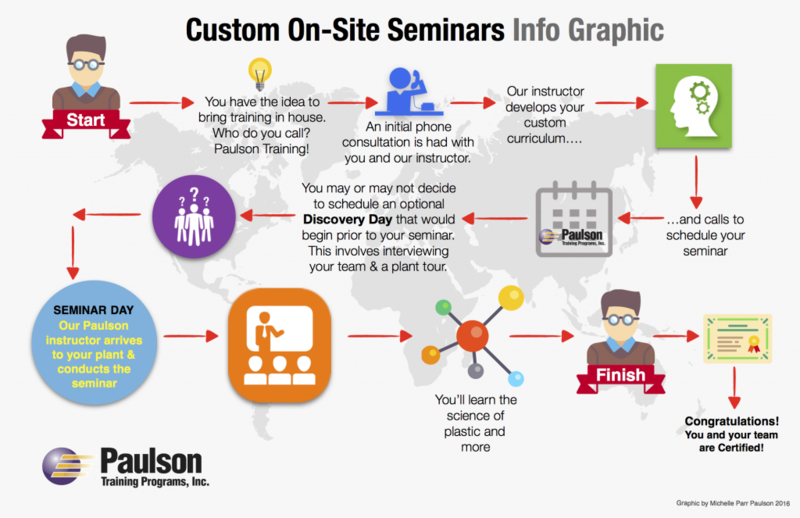 Download our custom on-site guide (see download icon below) or contact a Paulson Plastics Academy representative at 800-826-1901 or email info@paulsonplasticsacademy.com for more details.